← Are Cats Manipulative or Is What you See What you Get? It is said that in a room full of people a domestic cat is more likely to be attracted to a person who is either allergic to cats, hates cats or is a dog person. Why is this? I am not sure that it is entirely true to be honest but I’ll proceed on the basis that it is true. 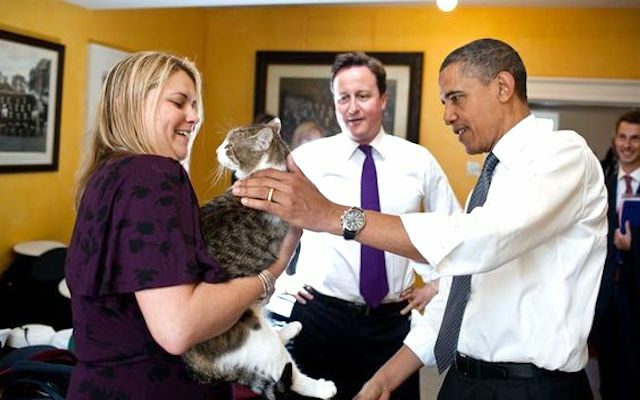 In this Larry (No 10’s house cat) meets Obama moment (see photo below), it must have been tricky for Larry. He is being held by the then Prime Minister’s aide so he is not free to move out of the way. I think the method of introduction was managed incorrectly but I understand why Larry was held. It allowed Obama to touch Larry. Obama is not a non-cat person but more a dog person as I recall. The reason why cats tend to be attracted to non-cat people in a formal setting is probably to do with how people present themselves to cats with whom they are unfamiliar. Non-cat people don’t want anything to do with the cat which inadvertently is perhaps the best way to introduce yourself to a strange cat: just ignore them and let them come forward to explore you. The alternative is to impose yourself too strongly on the cat which may be the behavior of some cat lovers who lean-forward from up on high and thrust hands into the cat’s face declaring through their body language that they love cats. This behavior may been threatening to a timid cat who runs or an opportunity for a confident cat to have a swipe in treating the hand as prey. I am generalising and exaggerating a little to make the point. It certainly pays to be confident when meeting a cat for the first time and still and calm. It also helps to not stand over them i.e. get down low but this is common sense. It is really about letting the cat make the moves and respecting the cat’s feelings and desires. Home→Cat Behavior→cat reading human behavior→Why are cats attracted to non-cat people? This entry was posted in cat reading human behavior and tagged approaching your cat, cat emotions, human behavior, stranger cats by Michael Broad. Bookmark the permalink. Yes you’re correct, Michael; that is my take on it too. I’d only add that non cat people tend to not look at cats as much or with intent (being disinterested) which is more comfortable for the cat than to stare at them. Letting the cat come to you is a technique from horse whispering too. In fact there’s a scene from the movie The Horse Whisperer where Robert Redford does exactly that. If someone’s untrained, unruly dog jumps all over you it’s because supposedly ‘ the dog can sense you are a good person’. Yeah the dog is obviously way off base because if it knew what I was thinking it would scoot for the nearest dark corner. If a cat find a person that they want to sit on or solicit attention people think ‘ the cat knows I don’t like it and therefore is being evil by wanting attention. I am not basing this on your article so much Micheal but life experience. I usually acquire the family cat where ever I go because I tend to sit quietly therefore I am blessed to have the kitty on my lap. On the other hand I have a list of homes and ex friends that I will no longer visit because of their ill behaved dogs. Notice I didn’t say I won’t go because they have dogs but those that have those ill behaved hounds that maul you at the door slobbering all over you while the owner smiles like it’s supposed to be fun getting covered in spit and scratched up. On the other hand there are few individual dogs whose company I quite enjoy and they find me quickly even though it’s pretty well known that I don’t care for canines. My personal opinion is companion animals should be well played with , fed and put to bed like small children before gaggles of people descend on their home.